Growing up in an Indian household, Indian food has been the staple of my diet for many years. Coming home from school to my mum’s amazing curries and savoury treats will always be a fond memory for me and something that always gives me a smile when I think back to those carefree days. Now that I am a fully fledged adult, I have to fend for myself of course (!) but Indian food will always be my go-to cuisine whenever I need a taste of home. That being said, I’m always excited when I hear of a new Indian restaurant on the London scene and I was certainly excited to try Chokhi Dhani in London’s upcoming and coming Battersea area. Amongst the newly built skyscrapers that line the River Thames there is a 2 and a half ton brass elephant that stands proudly outside Chokhi Dhani, letting passers-by know that this is no ordinary restaurant. In fact, all the trinkets and ornaments, heavy wood furnishings and intricate artwork of the restaurant was shipped over from Rajasthan in India, not an easy task in the slightest. However, when you stepped inside, you can immediately see that it was worth it. The decor is simply exquisite and really gives the restaurant that authentic Indian charm and feel. Of course, the proof of a restaurant’s quality is in its food so we took our seats upstairs at one of the solid Sheesham wood tables overlooking the River Thames. Whilst we studied the menu that offered dishes from across the subcontinent as well as from the ancient princely state of Rajasthan where the original restaurant is located, our friendly and attentive server recommended us some non-alcoholic cocktails...it was a school night after all! I tried the refreshing Spiced Blueberry Muffin which had rice and cinnamon coconut water, muddled fresh blueberries and apple juice whilst my guest had The Mumbai Mule with mango, cucumber, lime, honey syrup and topped with ginger beer. This cocktail was packed with the flavour of real Indian mango juice and really cleansed the palate for the first course. To celebrate Holi on the 20th March, the Hindu spring festival also known as the 'festival of colours,' Chokhi Dhani have put together a fabulous Holi Week Menu to celebrate the holiday in true Indian fashion. The menu features a fantastic array of celebratory Indian dishes such as Dhai Vada, Paneer Makhan Wala and Achari Gosht. We dined from the a la carte menu on our visit and it was genuinely hard to choose from the delicious sounding starters but we finally decided upon the Kadak Momo Chaat and Kachori. 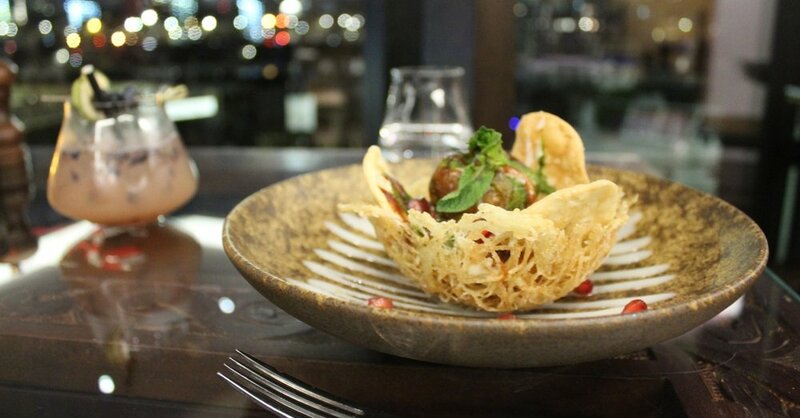 Chaat is a popular savoury dish in India and is one of my favourite snacks. It is essentially a crispy vegetarian dumpling covered in spiced potato and chickpeas and topped with yoghurt and tamarind sauce. This chaat was delicious and I especially loved the pomegranates to give it a sweet note alongside the perfectly spiced dumpling. Kachori, a pea filled crispy fried dumpling, is another favourite of mine, and my mother makes the best I’ve ever had so this one was up against some stiff competition! Of course, nothing can beat your own mother’s cooking but this Kachori was certainly of a high standard and the pea filling really brought back some fond memories. I highly recommend trying these savoury dishes, they are a taste and sensory sensation and you won’t be disappointed. For the main course, I decided on the Punjabi Karahi Murgh, a chicken dish with diced peppers and onion, slow cooked in a karahi style masala. To accompany it I went for the curious rosemary and cheese stuffed naan that certainly highlights the ‘contemporary twist’ element of the menu. There is also a matcha green tea mint paratha but I’ll save that for another time! The curry was one of the tastiest I’ve had in a long while. What makes a curry dish standout is of course the curry sauce itself and this masala sauce had a depth of flavour that really made the taste-buds sing. It also had just the right amount of spice-kick to it and was not too hot nor too mild. The naan surprisingly complemented the flavours of the dish and the rosemary did not overpower the taste of the masala. There was also plenty of cubes of chicken in the dish that were all tender and juicy and really soaked in the flavour of the thick curry sauce. A great dish. My guest decided to try one of the Rajasthani signature dishes on the menu and one that the restaurant is known for - The Maharaja Thali. A Thali is a popular meal found all over India and is made up of a selection of various dishes all served on a metal plate. It is popular with all Indians, rich and poor alike, and is quite a feast for all the senses. This thali had a selection of exquisite dishes including Kair Sangri trio of sundried beans with a touch of spices and yoghurt, Gatte Curry - gram flour gnocchi simmered in spiced yoghurt sauce, Laal Maas - succulent cubes of Lamb leg, yoghurt, mace and cardamom and Jodhpuri Murgh which is chicken fillets with yellow split gram & chilli curry. The standout dish from the thali for me was the Daal Baati Churma - a classic Rajasthani dish with daal panchmelli, ghee soaked Baati and Churma. Essentially, it is a large dumpling soaked in ghee that you dip into a spiced yellow lentil curry. I’d never had a dish like this before and my guest and I absolutely loved it. The thali also comes with rice, salad, and a selection of Indian breads. What’s more, you can get free refills on all the curry dishes, if you have room left for it! It is an impressive dish and I loved the fact that it came in a heavy silver platter with silver dishes for all the curries. A little thing but a nice touch that elevated the dining experience. By this time, we were quite full and content but of course we had to try dessert. I tried the Desi Mithai - traditional gulab jamun or dumplings soaked in sugar syrup with ginger and honey kulfi ice cream and finished with a mango gel. I love gulab jamun, a popular dessert amongst the Indian community, but I do find them quite sickly sweet. However, these ones were a good size and were not dripping with sugar syrup and had a real nice taste of cardamom and other spices. 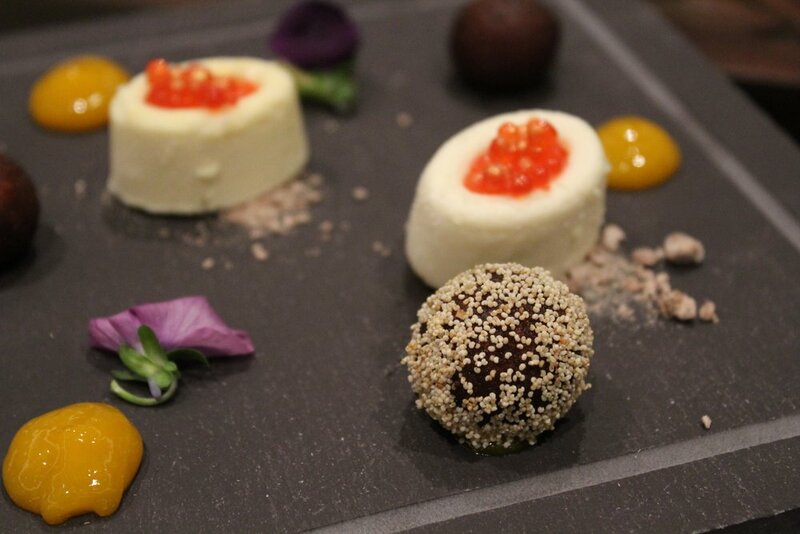 The kulfi was also nice with the taste of ginger and honey and I especially liked the pomegranate caviar that they were filled with. It was a refreshing and palate cleansing dessert. My guest opted for a more decadent finish to his meal and tried the Chocolate Sphere - a white chocolate dome filled with moist pistachio cake and millet brittle, organic milk Ice cream and scattered with shards of honeycomb. As expected these days, the waiter poured hot melting chocolate over the dome to melt it and reveal the inside. This really was an opulent dessert and you’d expected it to be a muddle of sweet flavours but each component of the dish was intact with its flavour including the pistachio cake and millet brittle. I especially loved the honeycomb shards that gave the dish a nice malty sweet finish. Along with our desserts we had Chokhi Dhani’s own blend of Masala Chai with cardamom, cloves, black pepper, nutmeg, and cinnamon. 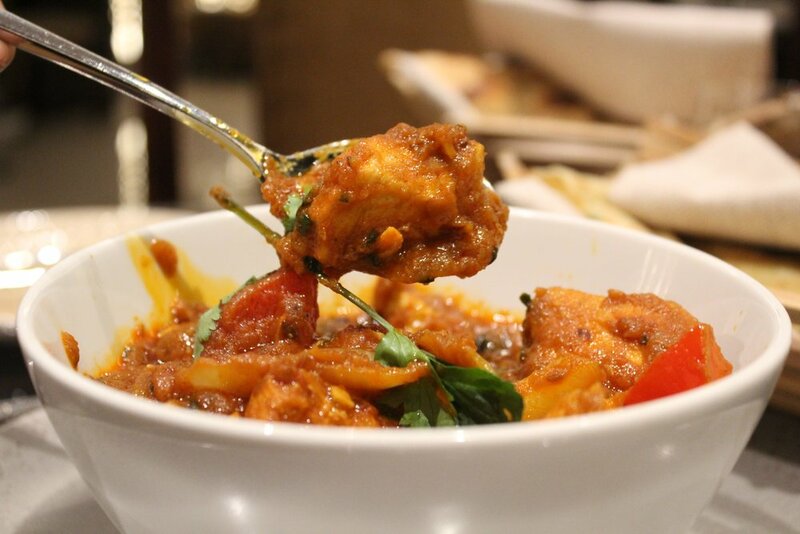 A truly Indian taste sensation and a great way to end our spectacular meal. Starters are priced at around £8-9, mains are £14-17 and desserts are around £9. The vegetarian thali is £32 and the meat thali is £35 which is by no knowns cheap but with the amount of food that you receive and the unlimited refills you don’t need to have a starter so it is quite good value for money in the long run. Perhaps visit on an empty stomach so you can really take advantage of the unlimited refills! Alcoholic cocktails are priced at a standard £11-12 and non-alcoholic cocktails are £5.50. I really enjoyed my experience at Chokhi Dhani and was really impressed by both the decor and the food. The high standard and range of quality dishes means I would certainly put it in the bracket of Dishoom and Cinnamon Kitchen. The stunning interiors and bespoke handmade artworks as well as the giant brass elephant guarding the entrance really enhances the dining experience and I’m glad to have found another Indian restaurant that I plan on visiting again when the need for the taste of home arises. The venue itself is perfect for couples and large groups alike, with a private dining space available for up to 14 guests. A special thanks to Choki Dhani and Romano for their hospitality!